Chalon, who is only three months old, is Dr. Tom Wang and Dr. Adam Terella’s first case of the day. Inside the operating room they work smoothly with the rest of their FACES team: Dr. Gerald Tanner as anesthesiologist, Jackie Linstram as scrub technician and Gay Tanner as operating room circulator. Dr. Terella and Dr. Wang work together seamlessly and several hours later Chalon is woken up and carried to the post-operative recovery area by Dr. Tanner. Post-op nurses Janet Nash, Tracey Naylor and Shellee Ramirez make sure Chalon has enough oxygen, is hydrated and as comfortable as possible. Finally, Yovana can come back to the recovery room to see her youngest daughter. She is apprehensive, worried about her daughter’s procedure, but anxious to get her scrubs on so she can be reunited with her child. She walks back and sees her daughter, tears come to her eyes and she cracks a smile. “Me bebe!” she exclaims with arms out. Last time she saw her daughter she had a wide gap dividing the left and right sides of her upper lip, also known as a cleft. Less than two hours later, Chalon’s upper lip is together and looks normal. The only evidence is the small line of stitches that connect her upper lip to her nose. “I am so happy and so excited to see her. Her lip looks so much better. Thank God!” says Yovana as she stares adoringly at her child in her arms. 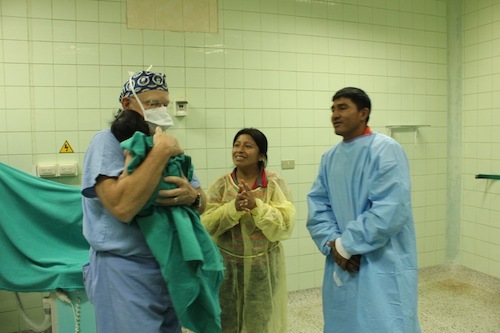 Yovana, who is from San Martin (ten minutes away from Lambayeque), delivered Chalon three months earlier at Hospital Belen, where the FACES team works while in Peru. 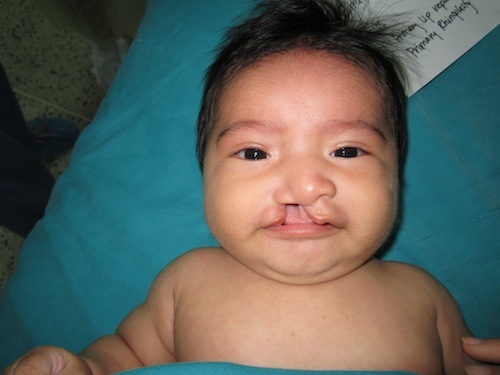 When her daughter was born with a cleft lip, one of the Hospital Belen doctors recommended she get in touch with FACES Foundation, as the group specializes in cleft lip and palate repair surgeries. Resting in her mother’s arms, Chalon hardly cries but is lulled into sleep by her mother’s cooing. When asked about her hopes for her daughter’s future, Yovana gazes down at her child and cracks a grin. “Quiero que mi hija sea una gran doctora! – I want my baby to be a great doctor,” she says with a laugh. Chalon before her cleft lip surgery. Dr. Gerald Tanner takes Chalon into surgery. Her mother, Yovana, and her husband say goodbye for a few hours. 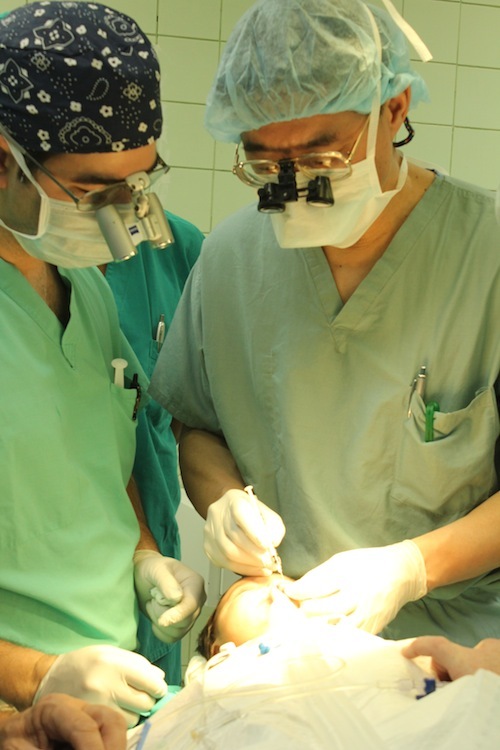 Dr. Adam Terella and Dr. Tom Wang during Chalon’s surgery. 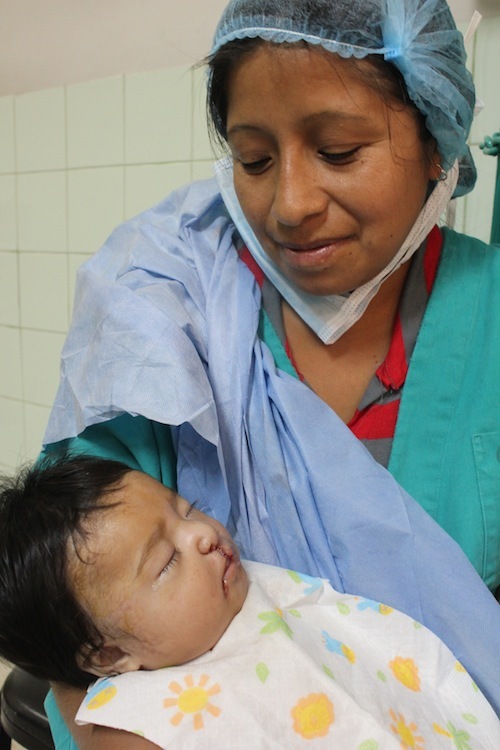 Yovana and her daughter, moments after she was reunited with her daughter after the cleft lip surgery.